Saturday January 27th 1900 Will took the butter to town it was a cold day. I was busy with the work till after early dinner I worked on my jacket. Carl came down to stay all night and brough the new lease. I read all the evenings in the papers. Sunday January 28th 1900 It was a very cold day. I got the meals and read a little, wrote three long letters and other writing Carl went down to Johns and home in afternoon. 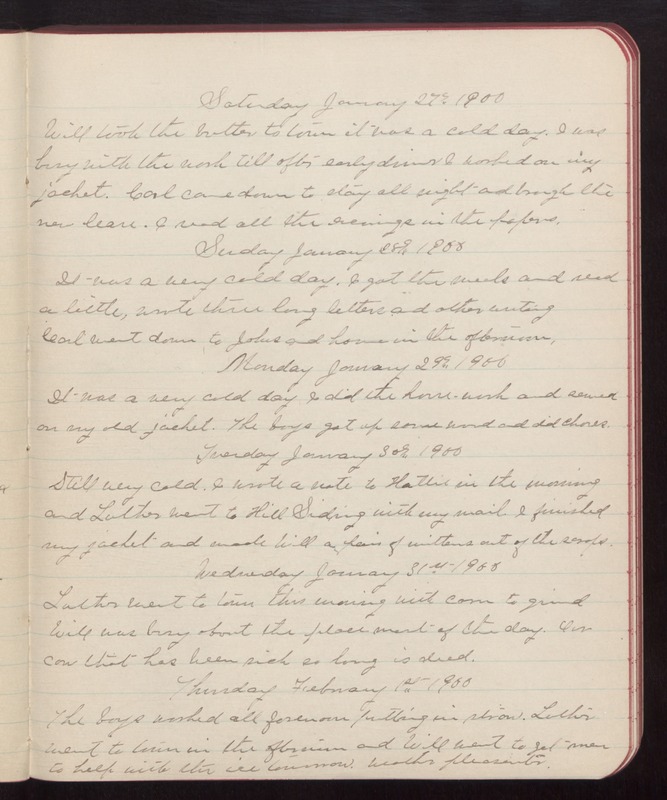 Monday January 29th 1900 It was a very cold day I did the house-work and sewed on my old jacket. The boys got up some wood and did chores. Tuesday January 30th 1900 Still very cold. I wrote a note to Hattie in the morning and Luther went to Hill Siding with my mail. I finished my jacket and made Will a pair of mittens out of the scraps. Wednesday January 31st 1900 Luther went to town this morning with corn to grind Will was busy about the place most of the day. Our cow that has been sick so long is dead. Thursday February 1st 1900 The boys worked all forenoon putting in straw. Luther went to town in the afternoon and Will went to get men to help with the ice tomorrow. Weather pleasanter.